FROM THE NORTH: Take the 110 South. Exit onto Carson Street. Turn right onto West Carson Street. Turn left onto Normandie Avenue. Make the first left onto Medical Foundation Drive. Turn right at the stop sign onto Medical Center drive and continue to the LA BioMed campus. FROM THE SOUTH: Take the 110 North. Exit toward Carson Street. Keep right and continue to Figueroa Street. Turn left onto Figueroa Street. Turn left onto West Carson. Turn left onto Normandie Avenue. Make the first left onto Medical Foundation Drive. Turn right at the stop sign onto Medical Center drive and continue to the LA BioMed campus. FROM THE WEST: Go east on West Carson. Turn right onto Normandie Avenue. Make the first left onto Medical Foundation Drive. Turn right at the stop sign onto Medical Center drive and continue to the LA BioMed campus. FROM THE EAST: Take the 405 North. Exit toward Avalon Boulevard South. Merge onto East Carson Street. Turn left onto Normandie Avenue. Make the first left onto Medical Foundation Drive. Turn right at the stop sign onto Medical Center drive and continue to the LA BioMed campus. Public parking is available in the areas on the highlighted map. Please be aware that our parking lots can be crowded, so allow for extra time when looking for a place to park. 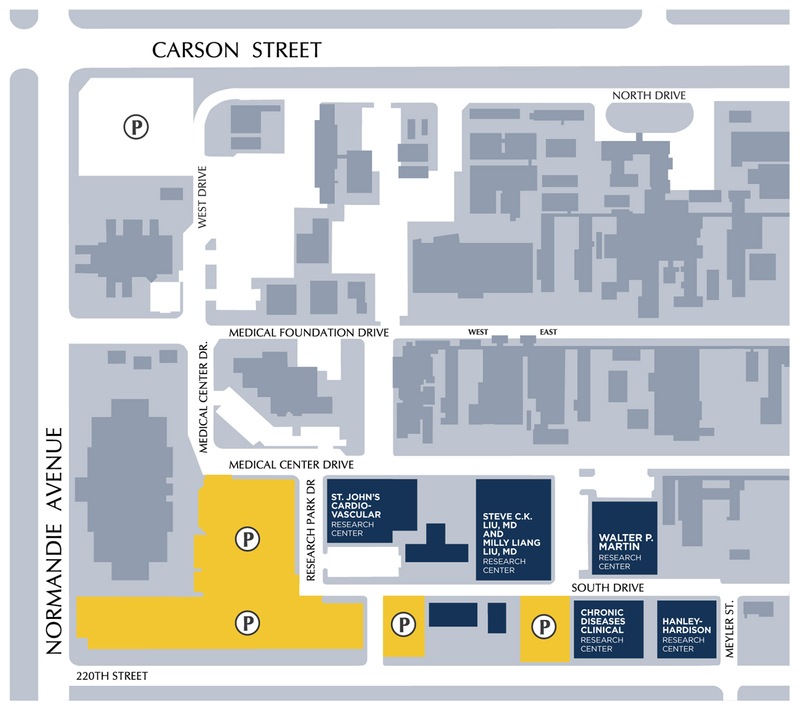 Parking is also available on the streets around campus on 220th Street and Carson Street.